jOrgan was designed to be is a MIDI console equally suitable for the architecture of a classical or a theater organ. 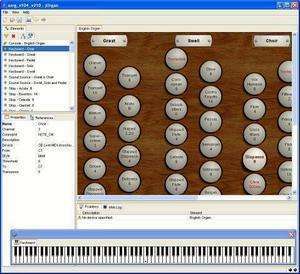 jOrgan can be configured to emulate any layout of organ console and mimics the behavior and appearance of a real organ console in detail, stops can be put on and taken off 'on the fly' whilst playing. It currently includes provision for second touch, settable combination pistons (divisional and general), swell controls, couplers, tremulants, and stop tabs or knobs. Multiple input and output ports can be used. Version 3.21 is a freeware program which does not have restrictions and it's free so it doesn't cost anything. For security reasons, you should also check out the jOrgan download at LO4D.com which includes virus and malware tests. Additional screenshots of this application download may be available, too. jOrgan download been highly rated by our users.